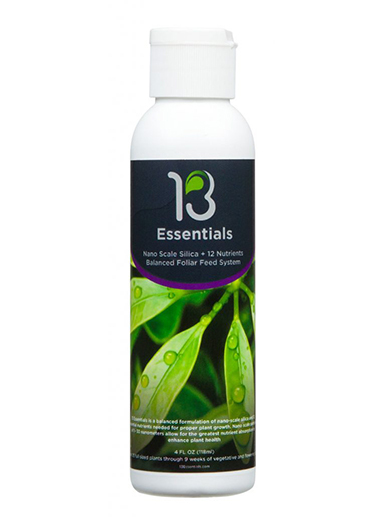 13Essentials is a balanced, nanoscale foliar spray fertilizer specially designed to increase the overall growth and health of your indoor plants. The unique formula contains Silica as well as 12 other nutrients to maximize results yielded by indoor plants grown in soil, hydroponically or in an alternate media such as coco. Contains: – 1 oz / 2 oz nanoscale Silica and Iron (FE) | Calcium (CA) | Boron (B) | Sulphur (S) | Magnesium (MG) | Zinc (ZN) | Manganese (MN)| Cobalt (CO) | Molybdenum (MO)| Copper (CU) | Phosphorus (P) | Potassium (K) | essential nutrients. What is it: – Non-toxic. Essential plant nutrients for increasing yields and growing stronger plants. Highly concentrated for maximum plant health. Who’s it for: – Perfect for every grower with a small to average crop or 3 – 10 indoor or outdoor plants. What to use it on: – Any plant grown in soil and / or hydroponic. Can be sprayed when lights are on. Instructions: Shake well. Mix 5 ml per gallon of water. Apply via spray/fogger to the upper and lower sides of the leaf. For best results apply every 7 days. Apply during vegetative and early flowering period. Great for seed treatment. Contains: – 4 oz nanoscale silica and Iron – FE,Calcium – CA,Boron – B, Sulfur – S,Magnesium – MG,Zinc – ZN,Manganese – MN,Cobalt – CO,Molybdenum – MO,Copper – CU,Phosphorus – P,Potassium – K essential nutrients. What is it: – Non-toxic. Essential plant nutrients for increasing yields and growing stronger plants. Highly concentrated for maximum plant health. Who’s it for: – Perfect for every grower with a medium size crop or 10 – 20 indoor or outdoor plants. What to use it on: – Any plant grown in soil and / or hydroponic. Can be sprayed when lights are on. Contains: – 8 oz nanoscale silica and Iron – FE,Calcium – CA,Boron – B, Sulfur – S,Magnesium – MG,Zinc – ZN,Manganese – MN,Cobalt – CO,Molybdenum – MO,Copper – CU,Phosphorus – P,Potassium – K essential nutrients. What is it: – Non-toxic. Essential plant nutrients for increasing yields and growing stronger plants. Highly concentrated for maximum plant health. Who’s it for: – Perfect for every grower with a medium to large crop or 20 – 40 indoor or outdoor plants. What to use it on: – Any plant grown in soil and / or hydroponic. Can be sprayed when lights are on. Contains: – 16 oz nanoscale silica and Iron – FE,Calcium – CA,Boron – B, Sulfur – S,Magnesium – MG,Zinc – ZN,Manganese – MN,Cobalt – CO,Molybdenum – MO,Copper – CU,Phosphorus – P,Potassium – K essential nutrients. What is it: – Non-toxic. Essential plant nutrients for increasing yields and growing stronger plants. Highly concentrated for maximum plant health. Who’s it for: – Perfect for every grower with a large crop or up to 40+ indoor or outdoor plants. What to use it on: – Any plant grown in soil and / or hydroponic. Can be sprayed when lights are on.